This is certainly a Happy weekend. Yesterday was Happy Valentine's Day, today is Happy Flag Day and tomorrow, is Happy Family Day. I hope everyone had an enjoyable Valentine's Day yesterday. My husband and I spent the day with our two little baby granddaughters and their parents. Today will be more of the same. Fifty years ago, on this day, Canada officially got its own flag. The flag we now have. There were three designs that were voted on and the single red maple leaf bordered with two red stripes won. I will not go into the history of the design since this site has done it so well. I have been busy quilting. I wanted to get this finished by today. 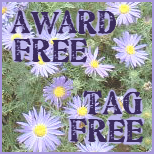 I am giving it to my little twin granddaughters who have very Canadian names: Mackenzie and Severn. I really was hoping that on the 50th Anniversary of the Canadian flag, I could give them a little version of the flag. I'd rather spend the time with them than getting this quilted on time. I'm sure they will understand, later in life, if I am a day or two late. As you can see, I did put this little 12" X 24" quilt on my floor frame. I know it's overkill for a small quilt but I am comfortable with it and it suits me. It wouldn't fit well in a hoop anyway and I didn't want to baste the heck out of it which is what I do when I don't use a hoop or a frame. Putting this on the frame was much less work and took less time. I'm having tea with my eldest grandson, Luc, this morning. His little brother, Patric, has been seen walking with his hands behind his back too. We don't know who else in the family does this. Luc lives way across the country and I don't get to see him or his little brother as often as I would like. 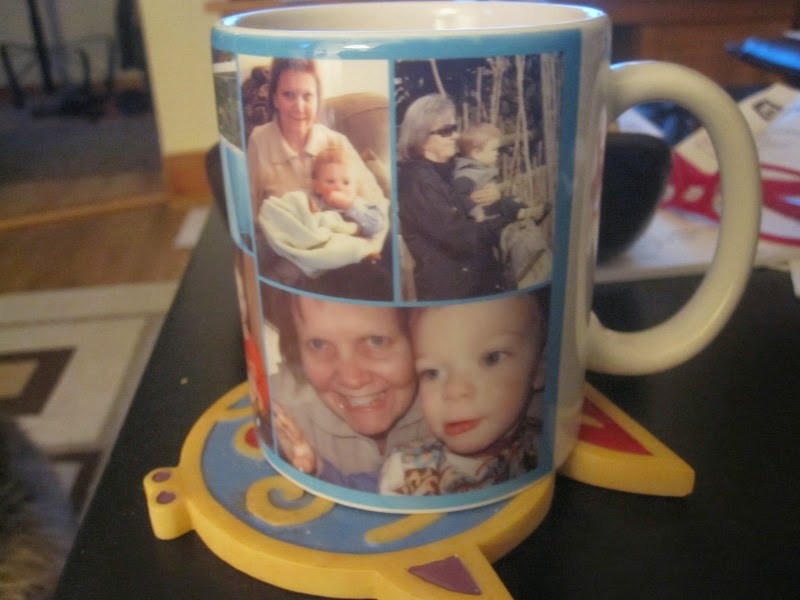 But there's always skype and there's always photos - and then, of course, there's always my mugs. 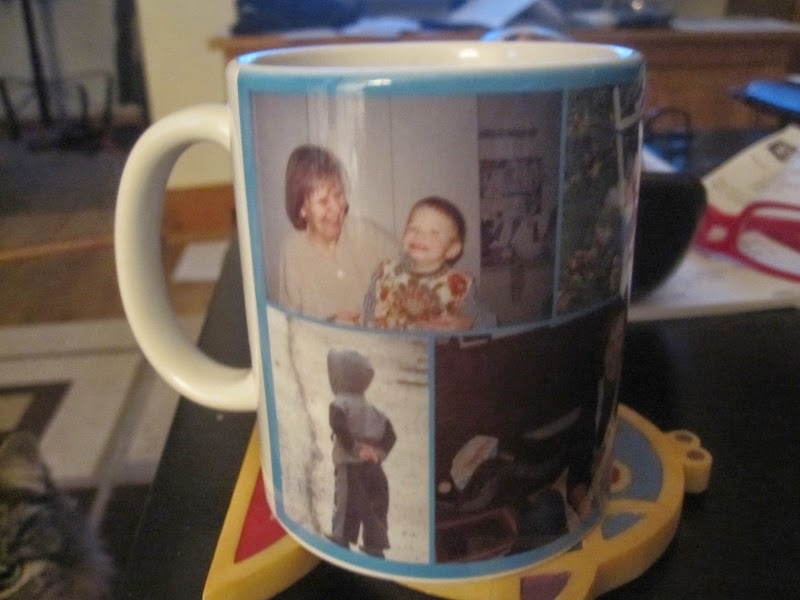 The other mug has little Patric's photo. Tomorrow is Family Day here in Ontario and it is a statutory holiday. Stores, banks and schools will be closed. I am hoping to finish the quilt tomorrow. It certainly is a weekend full of Happy. I hope your weekend is too. Happy flag day to you! Looks like you are celebrating with style! Oh my I did not know the current flag has only been around for 50 years. Well, it is a beauty and how fitting to make a flag for those grandbabies. I love seeing your floor frame loaded and ready to go. Also I wish we had a holiday to celebrate families in the states! Sounds like you have a wonderful family to celebrate too! Enjoy your Happy weekend. Your flag quilt is very pretty. I am sure your granddaughters will treasure it. Great family photos. Thanks for that little history lesson ... very interesting. Your little flag quilt is so sweet ... and that backing is just perfect! Love that little flag quilt Dolores! Enjoy the "Happy" weekend, and tea in that special mug!! I love your little fag quilt. 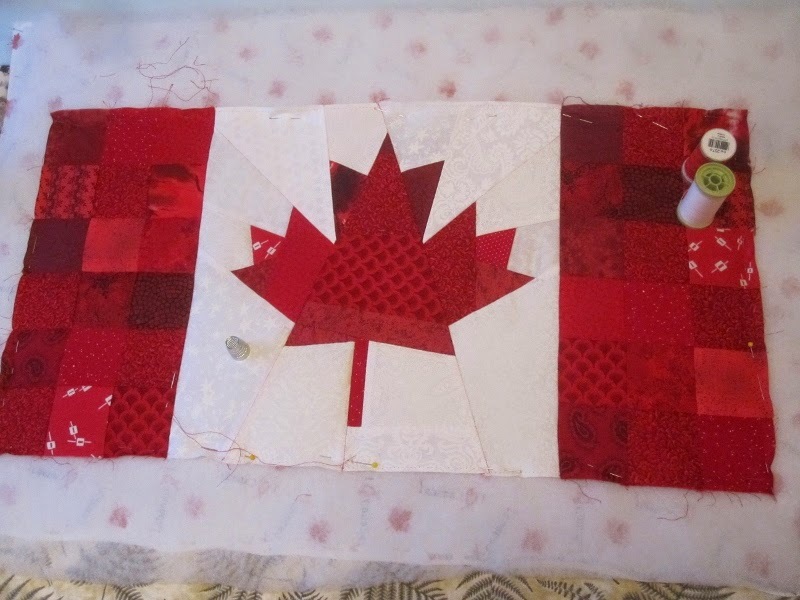 I have the flag quilt pattern from Cheryl Arkinson and hope to make it one day. Happy Flag day to you too! Here in BC, we had our Family Day last Monday and I sure would have like to be able to visit with my family who is across the pond. Oh well as you say, there is Skype. Say where did you get that wonderful backing fabric? I have never seen that before. Happy flag and family day to you! What a great treasure your granddaughters will have. Your mug is precious. Love your flag rendition. It's one of the more beautiful flag designs, I think. Looks great! Our flag is the most lovely of them all...but I tend to be biased. A super project for all of us to put an effort into and have to be proud of if not all year, than at least come July 1st! Love your mug! Happy Flag Day and Happy Family Day tomorrow. Well Happy everything, Dolores!!! I think we need a Grumble Day - just one day where we can grumble to our heart's content, then be happy the rest of the year, lol. 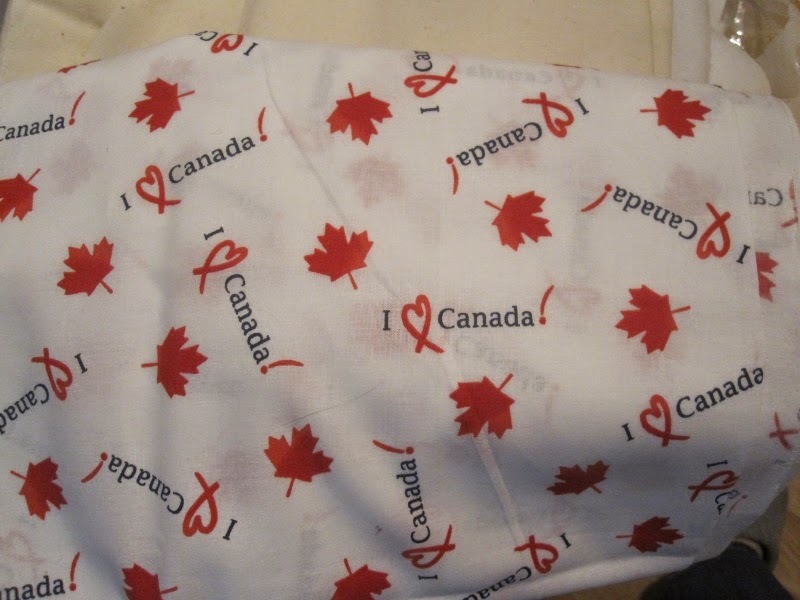 I LOVE your flag quilt, it's gorgeous - always did love the Canadian Flag - all my grandparents came from Ireland, to Canada, to Detroit for work. 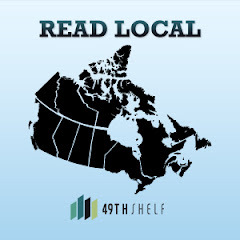 I have lots of family scattered across Canada. 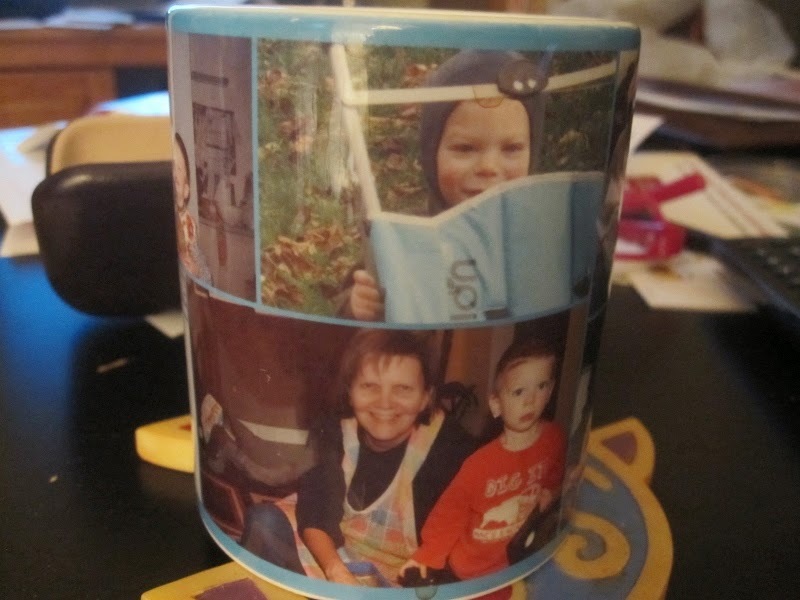 Your mugs are just darling, how nice to have a cuppa with those little boys! I love the flag. I didn't realise it was so 'young'. I suppose you were just expected to use the Union Flag before that? It's just so simple and instantly recognisable that it's hard to believe that it's not been around forever. The flag quilt is lovely and the backing is perfect. I remember the Canadian Flag contest (yes, I'm that old, and yes, it was big news in the US). I think Family Day is a wonderful idea. Happy every day to you! Your mug is sweet, you'll always have good company for your tea. The flag quilt will be a great treasure for the little girls. 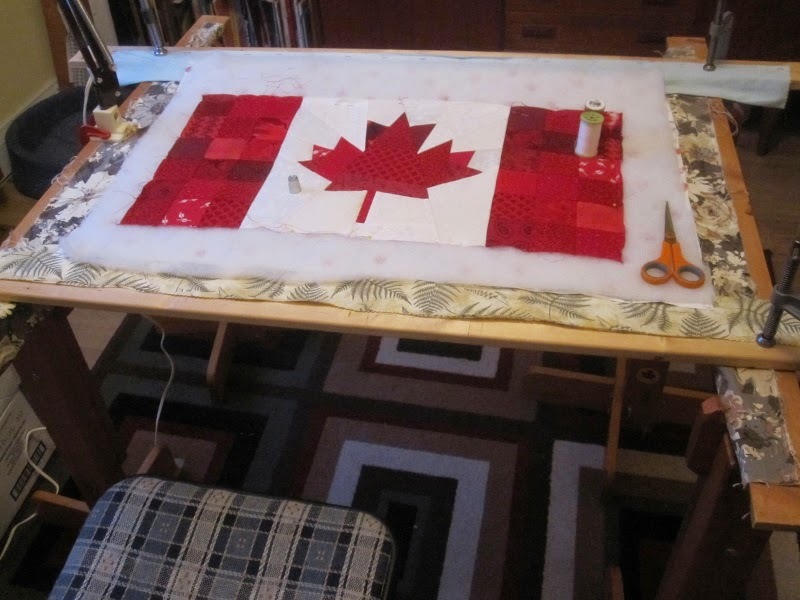 Hi Dolores ... love your Canadian flag quilt !! You realize, of course, that you will have to make two flag quilts? Otherwise they might fight over it when they get older. We babysat our little guy on Wednesday night - what fun!